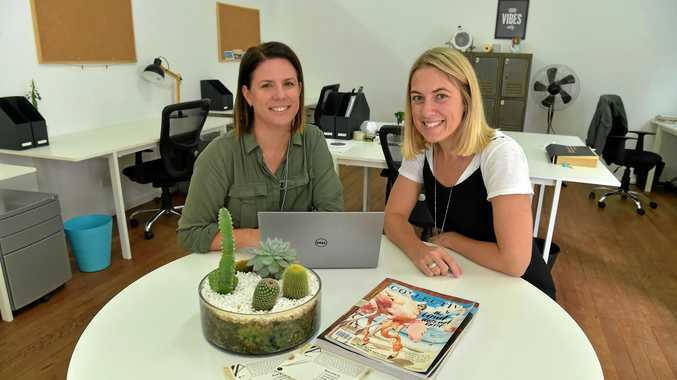 MAROOCHYDORE co-working office Share Space is back from the brink of collapse, with a new owner stepping in and re-opening the premises immediately. As reported by the Daily, Share Space announced its shock closure two weeks ago. But founder Celeste Mitchell has now handed over the reins to Kelly Gillies, who will manage the space while making it a home for her growing event business Freestyle Events. Ms Mitchell, who has been developing a business as a travel journalist, is now travelling too much to manage Share Space. "I'm at a point where I'm travelling once a month, so it's become hard to be here and have the presence at the bricks and mortar business," she said. Ms Mitchell said she was relieved and excited that Share Space will "live on". "We were hopeful we would find someone to lead the business into it's next phase of life and we feel absolutely confident of Ms Gillies being the right person to make that happen," she said. "I'm personally very happy to know Share Space will continue to trade as I plan to make good use of the space when I am on the Sunshine Coast in between travels in my career as a travel journalist." The unique co-working space was established two years ago in the old church hall on the corner of Beach Rd and Duporth Ave, Maroochydore. At the time it was the first of its kind in Maroochydore but since it opened has been joined by several nearby, each co-working space aiming to meet demand for collaborative working environments for small business operators and freelancers in the Coast's central region. The deal between Ms Gillies and Share Space's founders Ms Mitchell and Zac Gill will enable Share Space continue to trade with the same vision and passion of its founders, Ms Mitchell says. Ms Gillies said she'll build on the work and vision of its founders, providing a space that energises, inspires and motivates clients. "As a small business owner, I have struggled with the challenges of the home-based work environment and Share Space is exactly the style of workplace I crave - a motivating and productive space to share with adults and peers," she said. "Share Space will stay true to its core offering of good vibes and ridiculously fast internet." To welcome back loyal customers and invite new workmates, Share Space will be offering 'Space- Warming Specials' through the months of May and June. Deals on dedicated desks and hot desk bundles and use of the dedicated meeting venue, the "Un-Bored Room", will be on offer Ms Gillies said. Share Space is also offering free trial days, which will be available each Tuesday and Thursday. Full of ideas, Ms Gillies said another new addition would be the "Bike Break" concept, where two retro bikes will be available for customers to use at no charge. "Unblock the creative mind with a pedal to the beach or avoid parking pain as you head to the Plaza or Ocean Street eateries," she said. Ms Gillies said she intends to respect the history of the space as a dance hall and community meeting venue and will look to develop an after-hours program for weekday evenings and weekends, potentially including yoga, pilates, meditation, dance, craft and varied creative industries. The popular free "Nibbles and Know How" knowledge-sharing sessions are planned to continue with the next event happening on Tuesday June 6.